If you are looking to grow your garden, look no further than 9Gardens. This online store has all your gardening needs covered with a wide variety of seeds and plants on offer including colourful flowers, ornamental plants, vegetables, fruit and useful herbs. Also available is a selection of gardening tools to help you get the job done. This site is so easy to use and even offers a section dedicated to gardening tips to help you on your way to a beautiful garden. 9Gardens offers their customers a safe shopping experience with multiple payment options including a cash on delivery option and reliable delivery. For great discounts for April 2019 check out CouponSpy.in and start gardening today. Whether you are an experienced gardener or a budding enthusiast, 9Gardens is the place to go. This online gardening store has a range of ornamental plants and beautiful flowers on offer to add a pop of colour to your garden. You can also get creative in the kitchen with your very own herbs, fruits and vegetables right from your garden thanks to 9Gardens. Launched in 2012, this site aims to meet all your gardening needs, whether you are looking for seeds, plants, tools, or advice. With 9Gardens you can expect great customer service, quick delivery, safe online shopping and healthy plants. On 9Gardens you will find a wide variety of fruit and vegetable plants as well as seeds for purchase. These include grapes, avocado, tomato, dragon fruit, cabbage, spinach, chillies, pumpkin, carrot and many more. Add a touch of colour to your home with any of the beautiful flowers 9Gardens has to offer. There are seeds for cosmos, dahlia, petunias and calendula as well as marigolds, zinnias and so many others. Also available are ornamental plants such as poinsettias, gerberas, ornamental chillies and ornamental gourds. Bring flavour to your food with herbs from your own garden. 9Gardens stocks lettuce, dill, fenugreek, curry leaves, rosemary, lemon grass, mustard leaves and an assortment of other flavourful herbs. To make your gardening easier this site also stocks a range of gardening tools. Here you will find everything from folding saws and hedge shears to plant care sprays and seed germination pots. 9Gardens offers free shipping on all orders over Rs 400 and a charge of Rs 50 will be added to all orders below this total. Delivery will be made within four to six days by reputed courier companies. Using a coupon code to save is easy as well as rewarding. Make sure you have copied down the particular code you would like to use before you get started. During the checkout procedure look for the section titled 'discount codes' and fill yours in here. Once the code has been applied, your total will immediately reflect your discount. Items that have been damaged during delivery or are in any way defective can be returned within 28 days to receive a refund or replacement. Contact 9Gardens within five days of receiving the item and return it unused in its original packaging. 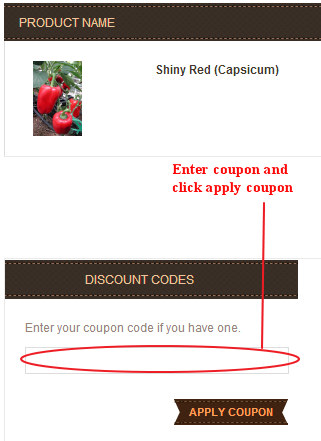 And get the latest 9Gardens coupons emailed! Share your 9Gardens coupon now!